Purchased from the U.S. Mint in Orlando FL at the F.U.N. show on the release day of the 2019 Congratulations Set. 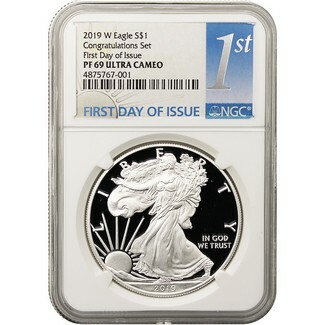 This allowed the West Point minted Proof Silver Eagle from the set to receive First Day Issue pedigree from NGC and this example is certified in near perfect PF69 Ultra Cameo condition.